Zhao Xiaomo graduated from the Middle School attached to the Central Academy of Fine Arts in 1969. In the same year, as an ‘intellectual youth’, Zhao was sent to the Beidahuang state farm in Heilongjiang where she began to create woodcuts together with a group of other intellectual youths from across China, under the direction of Hao Boyi (q.v.). 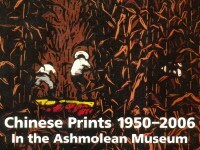 In 1978, Zhao was recruited as a postgraduate student in the CAFA’s Printmaking Department. After her graduation in 1980, she worked for the People’s Fine Arts Publishing House in Beijing for two decades, and later acted as an editor of Chinese Printmaking. Zhao’s early woodcuts reflect the strong influence of Soviet socialist realist style, whilst since the early 1980s, her interest has changed to folk style Chinese ink painting. This print records how during the Cultural Revolution, school graduates followed Mao’s call to ‘receive re-education from poor and lower-middle peasants’ and settled in the countryside to become state farmers. Schematic smiling is a typical symbol of that period. The artist was one of the ‘intellectual youths’ sent from the city to the remote Great Northern Wilderness state farm, where under the direction of Hao Boyi, she began to create woodcuts together with a group of other intellectual youths from different parts of China.